We were at Izzy’s, a barbecue place in Crown Heights, deep in the heart of Brooklyn. 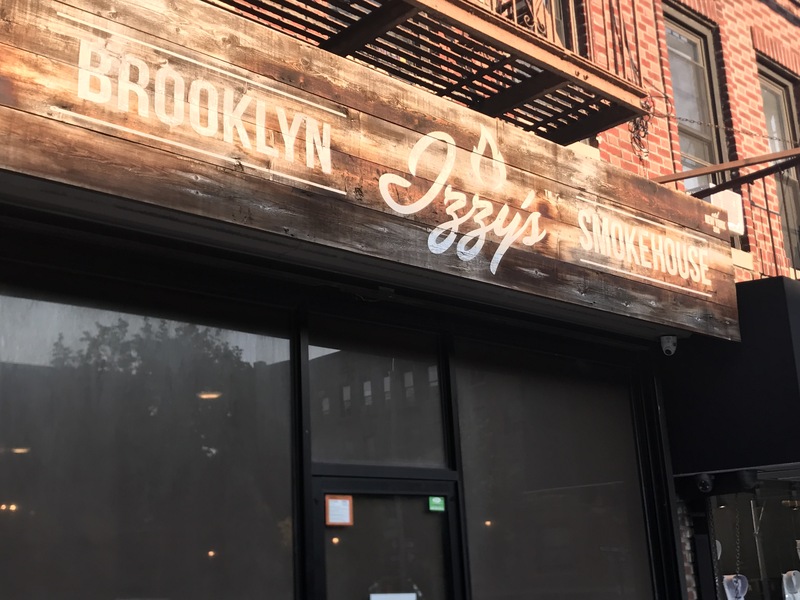 Earlier this year, Izzy’s was crowned The Brisket King of Brooklyn. And before any Texans start hopping around like an ant-bit four-year old, let me tell you who the judges were for this year’s Brisket King competition. I’d been meaning to hit Izzy’s since then, but hadn’t found the time until recently. Crown Heights isn’t exactly easy for me to get to from Bay Ridge. What did I find there? Some damn fine brisket. And chaos. The older I get, the less patience I have with lines or chaos or anything unexpected at a restaurant (unless I’m expecting the unexpected). I want a table. I want my food. I want to eat and drink with minimum fuss. But the fact of the matter is that Izzy’s little bit of chaos is in keeping with barbecue tradition. Many of the old-school barbecue places throughout the south are lunch-counters. Stand in line, get your food, find a seat or go back to the office and eat. And even in the south, these places can get downright nuts during the lunch rush. And especially with the now-famous places — Franklin’s and Snow’s in Texas — you can expect to wait for hours. You don’t have to wait for hours at Izzy’s. You don’t even have to wait 45 minutes like you do at Hometown BBQ in Red Hook. You do have to negotiate your way through folks waiting on their orders to place your own. It’s a bit cramped in there. (But don’t panic! There is a massive overflow room for seating two doors up the block. It’s a weird set-up, but it’s better than no set-up.) And different parts of your order may ultimately be delivered to you at different times. But these are small prices to pay for some damn fine brisket. Rich, moist, just the right amount of salt and pepper. Some might want a touch more smoke on their brisket, but I thought it was a good amount. The chicken was solid and the beans were excellent. We didn’t try the lamb. You have to be in the mood for lamb — and I wasn’t. The actual prices, however, aren’t small. The brisket is a few bucks more per half pound than Hometown. This is fine. I expected to pay more for kosher beef. My one quibble was with the prime-rib steaks and the beef ribs. I think the only other joint that offers prime rib in the city is Hill Country, where they sell it by the pound and are happy to slice off smaller increments for you. Izzy’s only offered steaks. They looked delicious. I really wanted one. Maybe some other time. Beef ribs, I’m used to paying a bit of a premium for as well, but the sizes available that evening were in the $60 range. Again, maybe next time. But I wanted to try the Brisket King’s brisket. And I’m glad I did. Should you go to Izzy’s? I give it an enthusiastic yes. 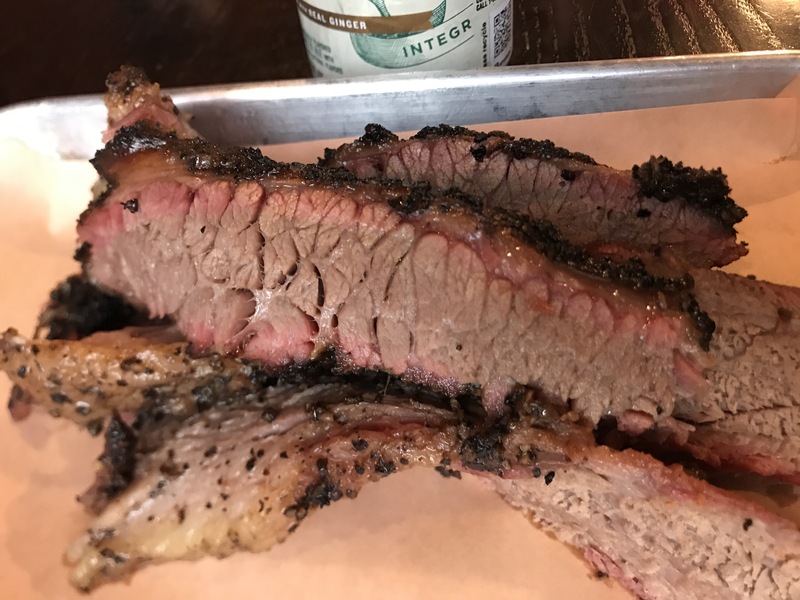 If you’re a fan of brisket and other barbecue cow parts, add this to your list. Bring a wallet — and maybe bring a bunch of friends so you can attack the entire menu. Know before you go. It might seem a bit cramped, but there is an overflow area. It might be a little crazy during dinner hours, but it’s not a long wait. There is no booze, if you’re looking to wet your whistle. And they’re closed on Fridays and Saturdays for religious observance. (Oh, and no pork, for obvious reasons).